Hi all am trying to find some info on Esperanzo - he is sire to one of my mares and the sire of the only registered foal by another of my mares (long before I owned her) I have seen photos of him and understand that he was quite awesome in the showring as a youngster!! 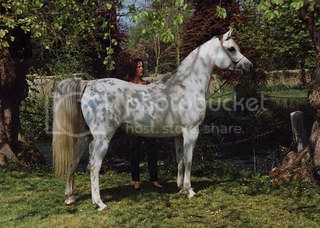 His breeding is Maleik El Kheil x Kazra El Saghira he would be 22 this year dob 15.01.87, have found out some info on him but not much - to the best of my knowledge he is still alive as the AHS do not have a record of him being deceased. Please if anyone has any info at all no matter how small please let me know as I would love to know more about this boy. I did hear somewhere along the line that he might have been exported but cannot find any conforamtion of this - as the advert says every little helps - and I would be grateful to anyone who can tell me anything. hi try ringing mac or chrsitine at Lewmack arabians they had him for a while along time ago. not sure of their email address but if yousearch you will find it. I will try and contact them. "If an 'alternative treatment' has reliable effect it becomes classified simply as MEDICINE" D.B. I can resist anything except temptation !! I had the pleasure of seeing Esparanzo on countless occassions and he was a wonderful looking horse!!! Very big and handsome. I think if I remember rightly that Danda Whalley had him aswell when he was younger, she owns/owned Strinesdale Stud near Oldham. Hi everyone and thank you so much for your help! Rosy thankyou so much for the photos of his mum have only just seen them as not been on for a few days. To the two ladies who provided the most info you know who you are a great big thank you! Well sadly it has been brought to my attention that Esperanzo - or Rocky - as he was known sadly died of a heart attack a few years ago. He had been exported to Saudi and was living a very happy life loved and cherished by all that knew him. So guess thats the end of the line - but found out a a lot about him and for everyone who helped once again thank you. Did anyone turn any photographs up of him and might not be the end of the line as there are a few listed on the all breeds by him. Hi Sue - thanks for that sorry didnt mean to mislead anyone - my comment "...Thats the end of the line ..." Was in reference to my search. Actuallt I own one of the mares on the list Sharanza a beautiful chestnut mare ridden with the sweetest of temperment. There is another daughter as well Silver Vendredi - believe she would be about 14/15 Esperanzo x Silver Solace who is another of my mares if anyone has ever seen or even heard of this mare I would love tohear from you. I have seen a few photos of Esperanzo one under saddle when Jilly washinton owned him and one when he was owned by Lewmack - anyone got any others would love to see them. Yes, me too, I 'd love to see any pic of Esperanzo, if any one has any please can you post them.or let me know and I'll post them for you. Maybe you folks with pic could add them to the allbreeds for everyone to see. I do have another pic of his dam as a youngster and this pic is another one from Emma Maxwell's collection. Hi all, I have a few pics of "Rocky", Esperanzo, I will dig them out and post them. It may take a few days as I have misplaced them due to a house move a few yrs ago. I'm not sure if I can post the good ones due to copyright????? Hi Jilly - as long as ou credit the photographer you will be ok! Still love to see these photo's at haydock Please. It's driving me mad , I can't find them......have thousands of photos but can't find ESPERANZO......found STORM SEEKER ( ESPERANZO X SIKA SAINT).... will keep looking.